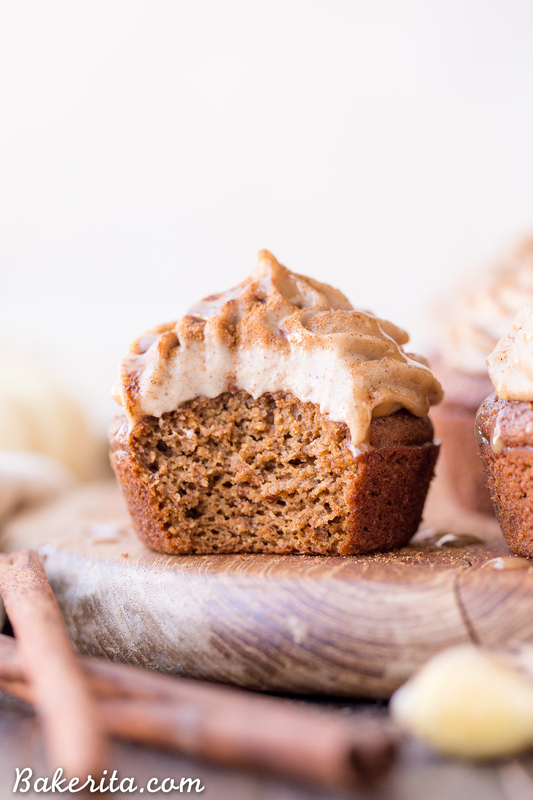 These Pumpkin Chai Cupcakes are soft, moist and bursting with warm chai spices and pumpkin flavor. 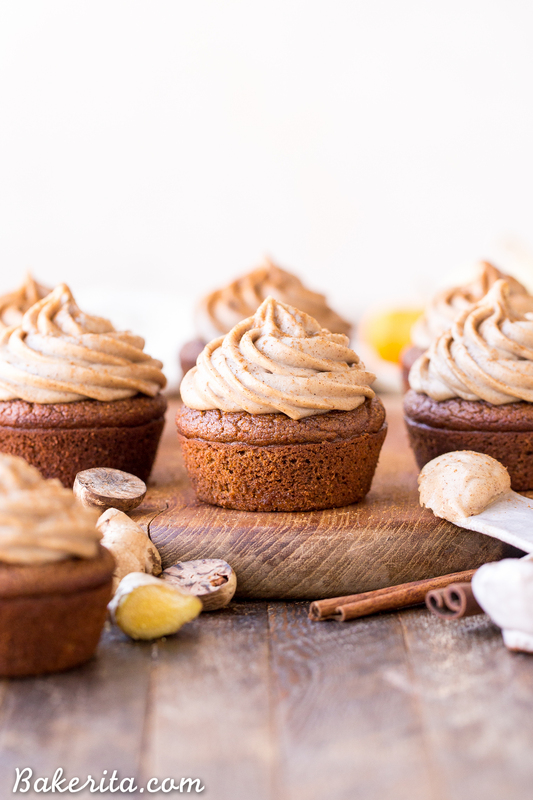 They’re topped with an irresistible cashew-based chai frosting that you’d never guess is paleo + vegan. This post is sponsored by Simple Mills. Slowly but surely, I’m building up my repertoire of cupcake recipes here on Bakerita. I’ve got a few OLD ones, but those are all full of gluten and sugar and things that don’t sit well with me anymore. Still working on creating a wealth of gluten-free, refined sugar-free, dairy-free, and paleo cupcake recipes. Luckily, we’re adding another cupcake recipe to the mix today. It’s seasonally on-point and absolutely delicious. I did get a little help from some of my favorite friends in the baking food space, though: Simple Mills. 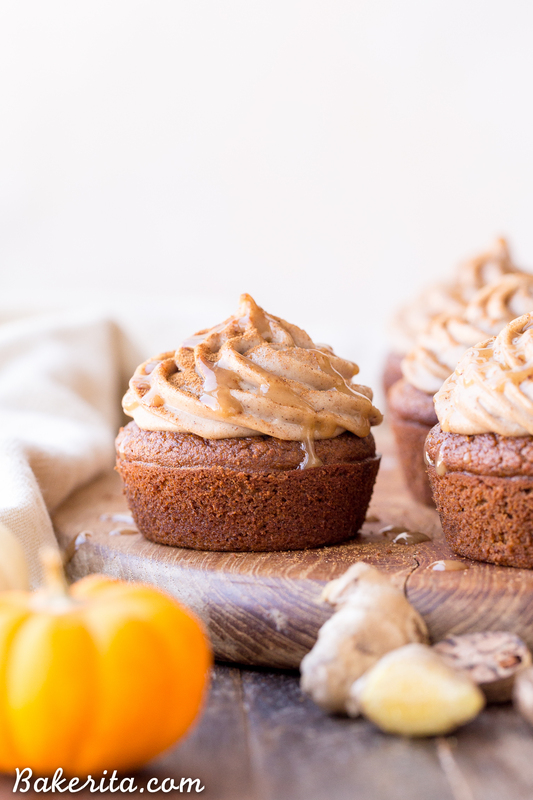 I made these Pumpkin Chai Cupcakes using Simple Mills Pumpkin Muffin & Loaf Mix, which is made with all of the cleanest ingredients. Their mixes have nothing that I didn’t already have in my own pantry, which is exactly how a mix should be. They’re completely grain-free and Paleo-friendly, with no preservatives. They’re pretty much what every processed food company should strive to be like, in my opinion. Even though these are technically muffins, they work deliciously well as cupcakes too! I switched the water called for on the package for non-dairy milk to add some richness. So, all you need to add to them to make them is three eggs, non-dairy milk of your choice (I used almond) and three tablespoons of oil (I used avocado oil). There’s also an egg-free option to make these vegan, if you check out the notes section. But of course, I couldn’t just leave them as plain old pumpkin cupcakes, so I added a healthy dose of chai spice to liven them up a bit. And ooooh man, did all the those warm spices add a DELICIOUS twist. Vanilla comes together with cinnamon, spicy ginger, cardamom, cloves, nutmeg, allspice, and a touch of black pepper to liven things up. Paired with the pumpkin flavor, it’s the perfect taste of fall. The texture is amazing too – so light and fluffy, but not soo light that it doesn’t hold up to the frosting. Speaking of that frosting, it’s pretty out of this world. It’s almost cream cheese frosting-like, and I’d be hardpressed to guess that it was a totally dairy-free and vegan frosting. It starts similarly to my no-bake cheesecakes – with soaked cashews! The soaked cashews are blended up in a smooth, creamy paste, which forms the base of the deliciously creamy spiced frosting. Coconut cream and coconut oil are added to the cashews to help the frosting firm up, and maple syrup is added to sweeten. A little fresh lemon juice goes in there too, which helps to cut through the richness and add a touch of that “cream cheese” tang. All the chai spices from the cake go into the frosting too, along with vanilla and salt. It’s blended to be super smooth, and then placed in the fridge or freezer to firm up. Once it’s cooled and whisked, the texture is similar to buttercream frosting! It can be whipped, piped, and just piled on top of a cupcake. No need for too much fuss :) add a sprinkle of spices or even a drizzle of paleo caramel sauce and go to town. 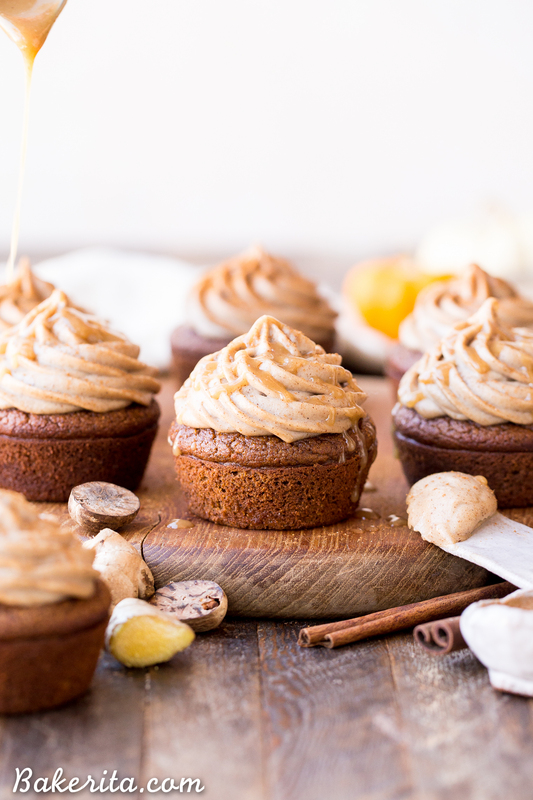 These Pumpkin Chai Cupcakes with Cashew Chai Frosting are bursting with warm spices and pumpkin flavor, with a decadent chai frosting that’s hard to resist. These would be a super fun addition to your holiday desserts, a fun weekend project, or just something to make any day of the week better. Enjoy! 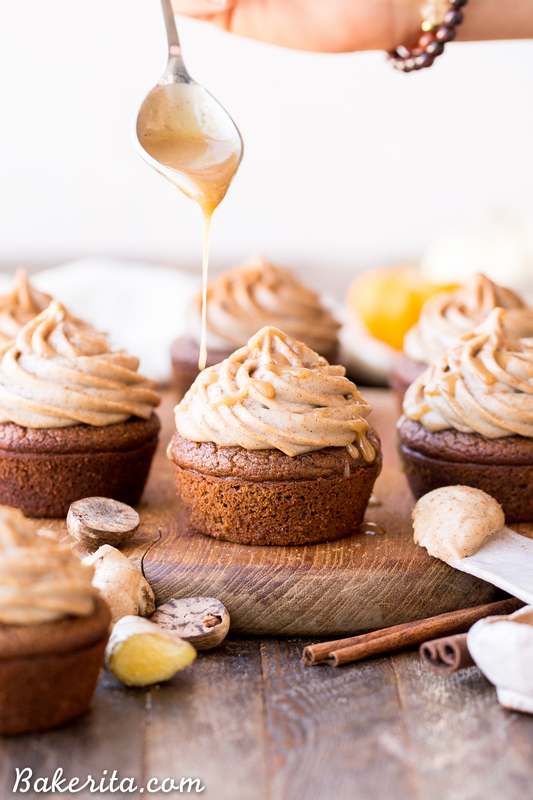 These Pumpkin Chai Cupcakes are soft, moist and bursting with warm chai spices and pumpkin flavor. 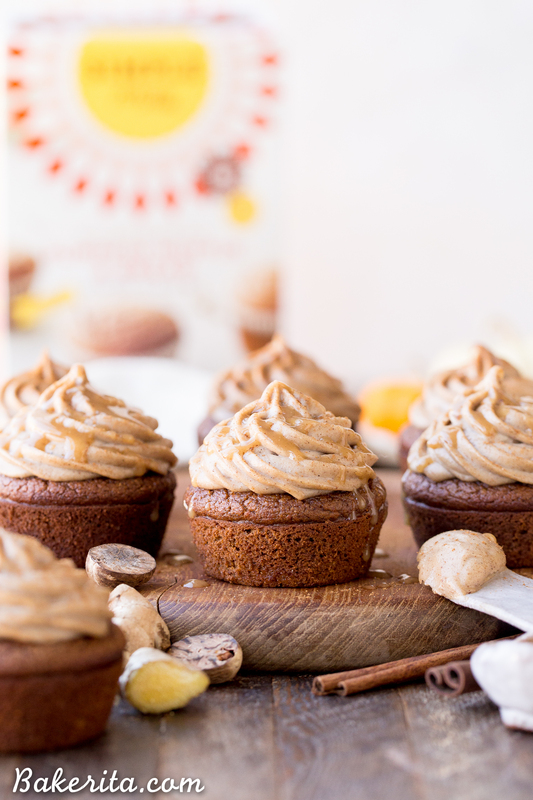 They're topped with an irresistible cashew-based chai frosting that you'd never guess is paleo + vegan. Preheat oven to 350°F. Lightly grease a muffin tin with coconut oil (recommended), or line with paper liners. In a large mixing bowl, whisk together the eggs, non-dairy milk, oil of choice, and vanilla extract. Add in all of the spices and the Simple Mills Pumpkin Muffin & Loaf Mix. Whisk to combine. Spoon batter into the prepared muffin tin, filling each 2/3 full. Bake for 18-22 minutes, or until a toothpick inserted into the center comes out clean. Let cool completely on a cooling rack before frosting. In a high powered blender (I used my Vitamix) or food processor, blend the soaked cashews until their smooth and creamy. Add the rest of the frosting ingredients and blend for 3-5 minutes, until completely smooth and creamy. Taste, and adjust spices/tartness/sweetness levels as desired. If you’re doing a thinner spread of frosting, you can frost as is. If you’d like to pipe the frosting, transfer it to a bowl and place in the freezer for one hour, whisking every 20 minutes, until it’s thickened enough to pipe on top of the cupcakes. After frosting cupcakes, garnish with a sprinkle of chai spice and a drizzle of paleo caramel sauce, if desired. *To replace the eggs, use ¾ cup unsweetened applesauce + 1½ teaspoons baking powder OR 3 flax eggs (3 tablespoons flax meal whisked with ½ cup water, let set for 5 minutes). Prep time doesn't include soaking the cashews or cooling down the frosting. This post is sponsored by Simple Mills. Thank you for supporting the brands that support Bakerita! As always, all opinions are my own. Is there a substitute for the mix? What flours are best to blend for a lighter texture? Looks amazing! Hi Janet! This recipe was specifically developed using the mix so I haven’t experimented with using anything in its place.